Dr Violeta Danciu, experienced dentist in Toronto, Bloor and Dundas West, Roncesvalles, High Park area, close to Dundas West subway station; call 416-417-7456 for an appointment. Your family deserves healthy teeth, and we can help you achieve those oral health goals. 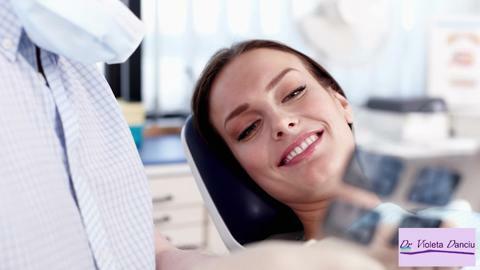 We offer full family and cosmetic dental services, including basic cleanings, x-rays, fillings, crowns, bridges and more. Whether you need some teeth replaced or help removing unwanted staining, our cosmetic dental services can give you your smile back. We provide in-office whitening, filling, veneer, crown, bridge, implant and denture services, designed to improve your oral health and give you a brighter, more confident smile. For your peace of mind, we’ll show you your digital x-ray scans on a computer monitor, letting you see exactly what the problem is and explain how we’ll correct it for you.